Willem van Aelst trained with his uncle Evert van Aelst in his native city of Delft and opted to specialise in still-life painting. At the age of eighteen he left Holland and settled in France where he lived between 1645 and 1649. He is then documented in Florence between 1649 and 1656 where he worked with the painter Otto Marseus van Schrieck and gained commissions from Cardinal Giovan Carlo de’Medici. Works by the artist from this period are to be found in the Palazzo Pitti. After eleven years away from Holland, Van Aelst returned to Delft in 1656 then moved to Amsterdam in 1657. He executed still lifes with flowers, dead game, weapons, foodstuffs and table items. His compositions changed little over the course of his career and are characterised by plain, dark backgrounds against which the various elements are outlined, and the use of veined marble tabletops or rich textiles, particularly velvet. Van Aelst also tended to locate the vases and other principal elements at the extreme front edge of the tabletops. In the present work, whose paint surface has been affected by an old restoration, Van Aelst used a habitual composition within his oeuvre but with some variations. He depicts a veined, grey and brown marble tabletop of which only one, turned leg is visible on the left. On top of the table is a costly cloth, which may be silk to judge from the type of folds, on which the artist has located the vase at the very edge of the table. 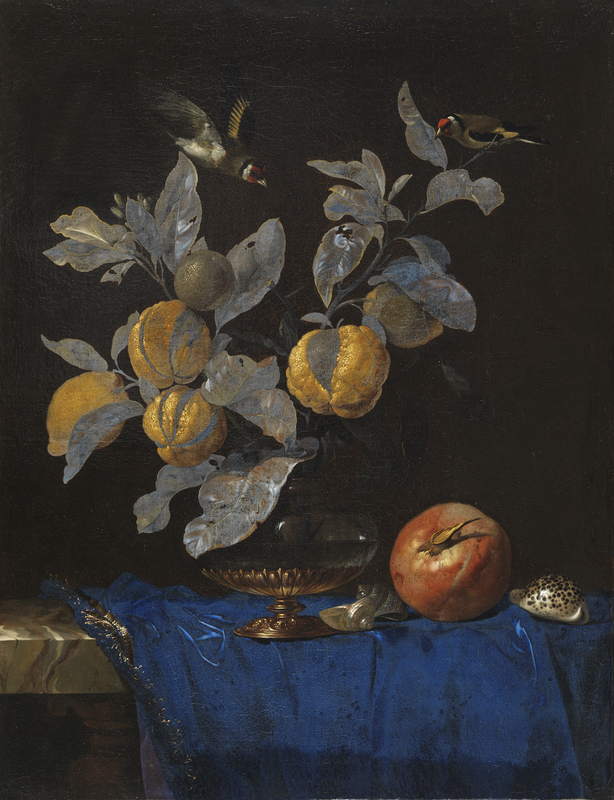 The blue of the cloth is a colour frequently used by Van Aelst, as is the background against which the fruit and branches are outlined, illuminated by a cool light. Van Aelst here includes two materials, glass and metal, which he was particularly skilled in depicting, revealing his technical merits and pleasure in interpreting the striking effects of light on these surfaces. The arrangement of flowers in the vase is unusual as rather than including striking blooms as its principal motif, it focuses on branches of different citrus trees with their finely painted fruit. The volume and weight of the fruit indicate that they must be supported on thick stalks or branches that have disappeared into the background but which provide a perch for one of the goldfinches at the top. The inclusion of these birds was one of Van Aelst’s innovations in his still lifes. The present canvas, painted after the artist had settled in Amsterdam, is a good example of the Dutch interest in the cultivation of citrus fruit, which was not particularly suited to the climate of the Low Countries. Gaskell refers to the publication in 1676 of a book that lists more than twenty species of citrus fruit, illustrated with engravings. It may offer one of the keys to interpreting this painting.